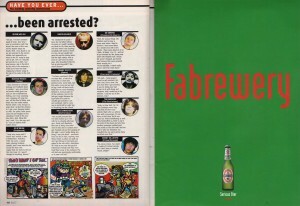 Have you ever… been arrested? This entry was posted in March 1998 and tagged David Holmes, Dodgy, Earl Brutus, Fun Lovin' Criminals, Irvine Welsh, Primal Scream, Radiohead, Space, The Charlatans, The Chemical Brothers. Bookmark the permalink.